Backers of a ballot initiative that would tax hotel guests to fund expansion of the convention center, aid the homeless and fix local roads submitted the required number signatures Monday. The Yes! 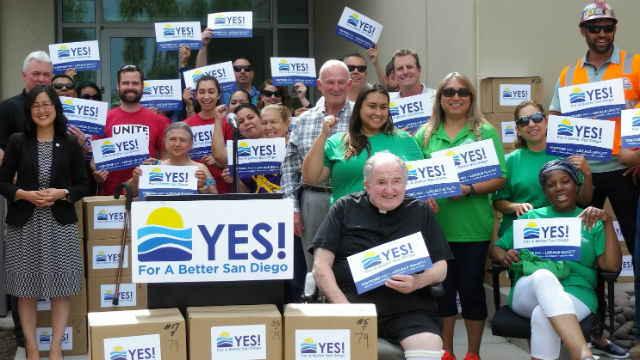 For a Better San Diego campaign delivered 79 boxes containing 114,000 petitions to the San Diego County Registrar of Voters. They needed to submit 71,000 valid petitions by Tuesday to get on the November ballot. Prominent in the crowd outside the registrar’s office in Kearny Mesa was Father Joe Carroll, now confined to a wheelchair, who praised the initiative for aiding the homeless and making streets safer for those who can’t walk. The initiative is a long-term solution to a number of problems. It would increase the transient occupancy tax through the year 2060 to raise $2 billion to aid the homeless, $3.8 billion to expand and maintain the San Diego Convention Center, and $604 million for road repairs. Passage in November would immediately generate $140 million over five years to help the homeless, allow the city to repair an additional 150 miles of streets each year and begin expansion of the convention center. The tax paid by visitors would rise by 1.25 percentage points for rooms on the periphery of the city to 3.25 points for those downtown. Supporters include social services agencies like Father Joe’s Villages, the hotel industry, Mayor Kevin Faulconer and organized labor. An earlier effort failed to pass the City Council, leading to the current signature campaign.